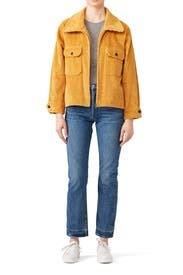 Crafted from bright corduroy for a vintage look, this boxy jacket by The Great. is as cool as it is cozy. 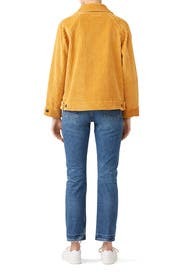 Yellow corduroy (100% Cotton). Jacket. Long sleeves. Exposed front zipper closure. Front flap pockets. Partially lined. 25" from shoulder to hemline. Imported. Cute but it sheds fuzz! 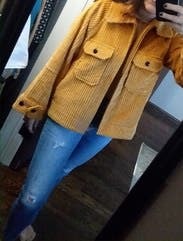 Love the color & look of this cjacket (it came with tag on!) but it shed yellow fuzzy stuff all over my black cotton pants. Stand out comfort and style! Love this coat! The texture, the color, the fit all make it a showstopper for any day! Adds instant cool factor to any outfit! So perfect for fall. Nice body jacket that layers well. Wore for a weekend away and definitely recommend for traveling. Got so many compliments on this jacket! Runs big but is good for layering. I wore a hoodie under. Runs large but is very warm. 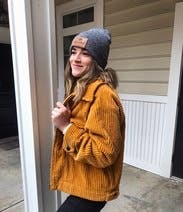 This mustard coat hit my sweet spot in terms of style: as comfortable as LL Bean pajamas, and a statement piece. Loved the thick cord. Wore it to work for a week. It's oversized so I got a zero (usually wear a 2 for coats). Jacket had a boxy fit, which was something I liked. Originally intended to rent it for 2-3 days ended up keeping for over a week. So tempted to buy it! I am obsessed with this jacket. 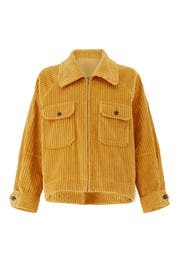 The mustard color and corduroy fabric are right on trend. I also loved the oversized fit. This is hands-down one of my favorite rentals ever! Extremely fun to wear, it makes any outfit looks so cool! It is very boxy and oversized, which I love. I wore it a bunch of times dressed up and dressed down. Loved it! Absolutely amazing jacket that is so comfortable. The texture is so much more eye catching in person!! This jacket fits over everything! Loved this jacket!! 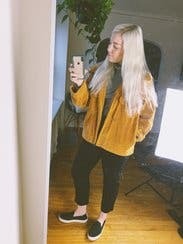 I personally love an oversized fit that can be thrown on over multiple outfits, would rent again! 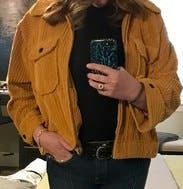 I rented this to wear to a hockey game in Nashville - stepped out of my comfort zone with the color. I originally got a size 3. It was huge! Tried to switch it for a 2, but only size 1 was available so I went with that. I'm a 36DDD and it was still roomy. Plus the fit is definitely boxy, so I'd recommend sizing down at least once. The quality is very nice. It wasn't too thin or too heavy. I ordered it too big because I knew that was the look and I wanted it to be oversized, but it certainly will be. Picked this up in Chicago at the RTR store. Love, love, love this jacket. Great color, perfect for fall weather in the north east. 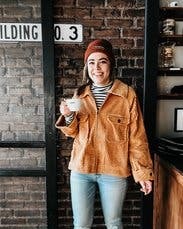 Corduroy pumpkin colored boxy jacket. Oversized fit. 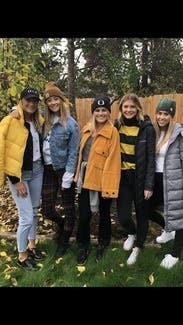 Great for fall. Casual. I LOVE this jacket! It's so fun. It runs big, so it's roomy and comfy. this jacket is adorable, it's like a swing coat style. a little big baggier but it adds to the look - i love the corduroy and the color is outstanding. 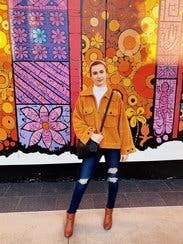 i have gotten numerous compliments - a must fall rent! 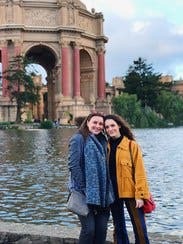 Got compliments from everyone on this coat, from my peer group (50's) to my daughters (20's). Nice loose fit, but very stylish with a pair of snug jeans. This oversized jacket is amazing. At least in California, it is VERY stylish. Someone stopped me on the way up to communion in church just to compliment it, and I received tons of other compliments. I love the oversized look, the color and the style. It is definitely oversized but the jacket fits perfectly, as far as sleeve length, shoulders and width. I would consider buying this one. The color goes with everything!